Because of their graceful, elegant, and muscular physique, Abyssinian cats are said to be descendants of the ancient cats of Egypt, just like the ones you see in Egyptian sculptures or paintings of cats. However, this theory has not yet been established. The history of these felines is rather vague and there is no clear evidence yet as to where these cats came from. The name “Abyssinian” was said to be derived from Abyssinia, now known as Ethiopia. This does not necessarily mean, however, that it was where these cats originated. It was only mentioned in one magazine in England, which was published in 1872, that a cat which won a prize in a show was “captured in the late Abyssinian war”, thus the name. Along with the article was a drawing of the Abyssinian cat. Another book which was published in 1874 mentioned something about a cat which was named Zula. Based on the book, Zula was from Abyssinia. 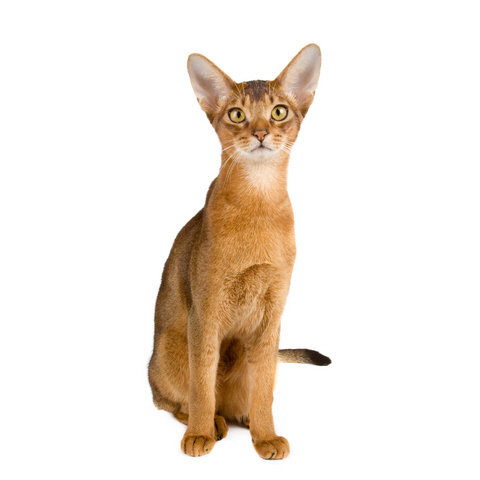 Some said all Abyssinian cats in America, Australia, and Europe are descendants of Zula, but this is not yet proven. It is also thought that there are Abyssinian cats which hail from North Africa. The physical characteristics of Abyssinian cats are muscular bodies, well-developed bone structures, and proportionality of their body parts. They have medium-sized bodies, not too fat, not too thin which makes them very agile and active. Several colors of Abyssinians have been developed including—sorrel, blue, fawn, tortoiseshell, red, cream, lilac, and chocolate, and silver. When young Abyssinians are born, they have dark fur and which turns light in color after several months as they mature. To achieve or exceed the expected life spans of these domestic felines, you have to know how to properly take care of them. You can get tips from your veterinarian as well as doing your own research on the particulars of the breed. Known to be one of the most intelligent breeds of cats, it is very important that pet owners always shower them with attention because they get bored easily. They love to be with people, though they do not usually want to sit on your lap. If you are doing something, you will always find your Abyssinian cat trying to help you. Abyssinians make wonderful companions and loyal pets. Abyssinian cats can sometimes manipulate you to do whatever they want you to do. This is probably because they are witty and intelligent. They also have very curious and inquisitive minds. They are curious about certain things such as new surroundings and objects, unfamiliar sounds, etc. although, they will not put themselves in danger. They are a very smart feline who knows which things could pose risks to their safety. Among all the short-haired cat breeds, Abyssinian cats are one of the most popular probably because of their elegant appearance and intelligent and keen eyes. They also have the mystique of being one of the oldest cat breeds. Who knows, they might have brought with them a bit of interesting history and rich culture which can be traced to an old civilization thousands of years ago. Next PostNext Types Of Cats – Which One Is Right For You?